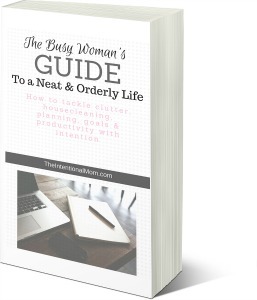 The Busy Woman's Guide To a Neat & Orderly Life Is the Solution You've Been Looking For! And It's FREE! Are you continually left with more to do in a day than you have minutes in a day? Do you fear that a clean home is out of reach? Are your goals always out of your reach? Do you long to move forward - finally? The good news is: I've broken down everything you need to master your productivity, cleaning, clutter, schedules, and goals and put them all in this one productivity guide. This is the one tool that just might change your life. SEND ME THE FREE PROGRAM GUIDE!